The long flowering salvia ‘Costa Rica Blue’ (Salvia guaranitica ‘Costa Rica’) – picture right- is one of the best blue salvias available, sometimes referred to as the ‘blue anise sage’. The deep blue flowers have a translucency to them offset by the deeper blue almost black calyx. Like many salvias this is a fairly tall growing plant, to 2.5m depending on conditions, however it is easily pruned back and it will soon re shoot to continue producing masses of flowers. Try removing older stems at regular intervals to promote new growth. Hard pruning can take place when the flowers stop. Full sun is best and a well drained humus rich soil, although like many salvias ‘Costa Rican Blue’ is not that fussy and can handle part shade as well. Flowering from early autumn right through to early summer this is truly a long flowering salvia, attractive to birds, easy care and those lovely flowers as well. 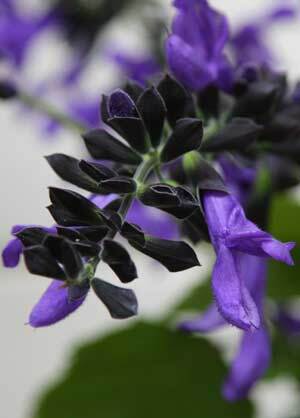 Plant this salvia in groups of three or four for a fantastic massed display, also try growing in a large pot or container for added impact. Costa rica blue sage can be used in the mixed garden border or as an addition to a cottage garden style planting. Like many of the species it is very attractive to birds. Many species of salvia produce blue flowers including the much sought after (but illegal as plants or seeds in Australia) Salvia divinorum, along with S. nemorosa ‘Blue Hill’, S. jurisicii ‘Blue’, S. guaranitica and the lovely pale blue S. uligosa. All are drought tolerant and make excellent plants for the cottage garden or border.